As I write this, it’s something like 3:30am. I’m back in the United States, suffering jet lag with a side dish of worry. Since I can’t sleep, I’ll bring you up to date on what happened between Siem Reap and Kansas City. As I mentioned at the end of my post about Siem Reap, I caught a plane to Bangkok the morning after my tour of the ancient temples. I landed at the other Bangkok airport, DMK. That one was the original airport for the city, but then when the much more modern BKK airport was opened, DMK shut down and was hugely renovated. Now it’s used for domestic flights and international flights on budget airlines like AirAsia. After dealing with the usual passport control, baggage, and customs, I caught a cab to the hotel. I had decided to stay in the same hotel where Beth and I stayed a few nights before going to Cambodia. It’s called Pas Cher Hotel de Bangkok, and I thought it was a good deal, well maintained, comfortable, and in a really good location, close to both the central pier for the water taxis and one of the BTS Sky Train terminals. Though there are several hotels on this small side street that cater mostly to tourists, it’s also a residential area for regular people, so you can find normal shops that aren’t overprices, good street food, etc. I had about 24 hours to deal with my errands, sleep, and try to get in some more sightseeing if possible. Once I checked in and dropped off my bags, I decided to set out by foot and Sky Train (their elevated metro system) on my errands. The iPhone that I had bought from T-Mobile in the US and then sent to my company’s office in Bangkok had finally arrived, with no time to spare. And I also got an email that the repairs to the iPad I’d dropped off at the Apple repair center were also done ahead of schedule. So I headed out, stopping first at a little food stand near the hotel for some duck noodle soup for a late lunch. It was tasty but greasy from the duck, and I added a little too much chili to it. But it hit the spot, and only cost 40 baht, which is about $1.10 right now. Then I went to the office, picked up the phone, chatted with the office manager and thanked her profusely, and then went to the Amarin Plaza shopping mall, picked up the tablet, and had a cold drink. It was rush hour, and I took an alternate way back to the hotel that meant less walking but transferring from one train to the other. I did not stop for a massage and was back to the hotel in no time, my errands taking only about two hours total. I spent that evening transferring stuff from my old phone to the new one, trying to restore my iPad with the backup I made before sending it in for service, and — after a much needed shower — staying relatively cool. The next day I didn’t need to leave for my flight until about 6:00pm. 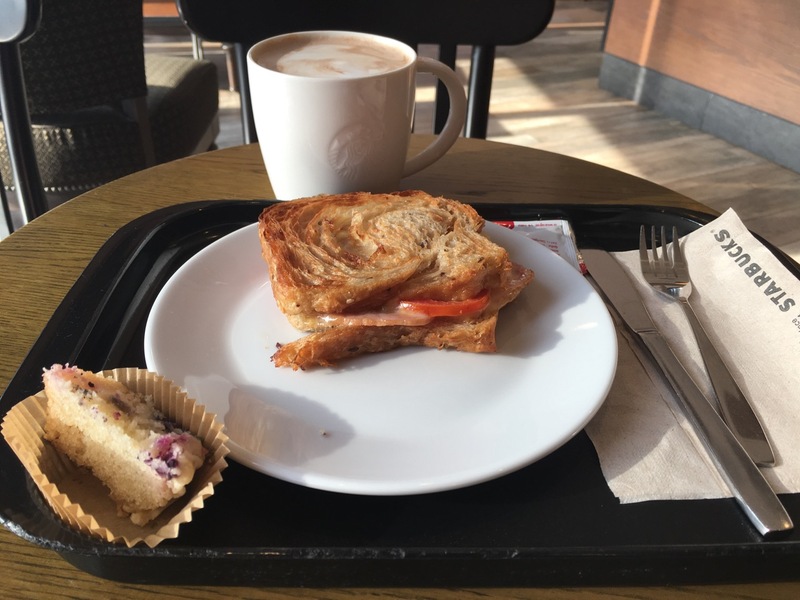 I went out for breakfast, getting sucked into the local Starbucks where I spent over seven dollars on a breakfast of a reheated ham sandwich and a cappuccino. That’s the Starbucks tax, I guess. When I inquired with the hotel front desk about extending my check out time, they said to extend it until that late I’d just need to buy another night. So that’s what I did, deciding that having a place to store my stuff all day, nap, and take one last shower before getting on the plane was worth the $25. But first, I made one last effort to find someone to trim my beard. It had been surprisingly difficult to find a men’s barber in this area. I found several hair salons, but whenever I asked they told me they don’t work on men. I finally found a place that listed prices for both men and women, so I went in. There were two stylists just sitting on couches in the front, dinking with their mobile phones, so I asked if they can cut a beard. “No” was the answer. But then I asked if they have an electric trimmer (using lots of pantomiming and sound effects, since I know almost zero Thai), and the girl admitted she does and would be willing to try. It was pretty clear as the operation progressed that mine was the first beard she had ever trimmed. But I gave her words of encouragement and advice, and we got through it. Since getting your hair washed was part of the price, I opted for that. I had even less hair than usual, but what I had she washed and rinsed twice. At least that gets the little cut hairs out so they don’t fall on things later. 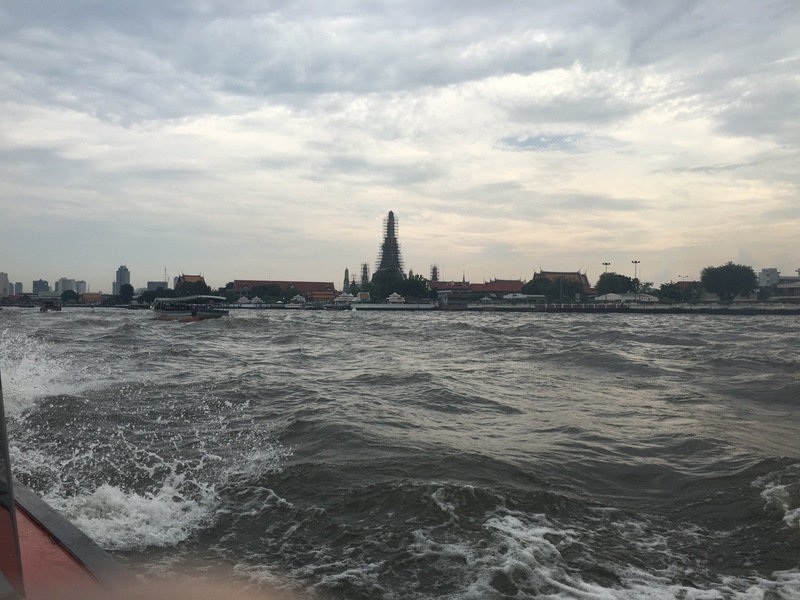 I paid her the 30 baht price, and headed for the water taxi station. In Bangkok there are a few different express boat lines. The city is built around a river, and the river is very important for transportation of people and cargo. One of these express boat lines is called the “Tourist Boat“. It stops at just a subset of all the normal stops, the ones that most tourists care about. And during the ride, an announcer narrates what you’re seeing on each side of the river, in English. I bought the all day unlimited ride pass for 140 baht, in case I wanted to get off and back on a few times. In the end, I just rode it to the end of the line. When we got there, everyone has to get off anyhow, and there was a downpour. So I walked out the street and sought any place that could shelter me from the rain. And there it was, a high end coffee shop, called FOONG Coffee & Bar. 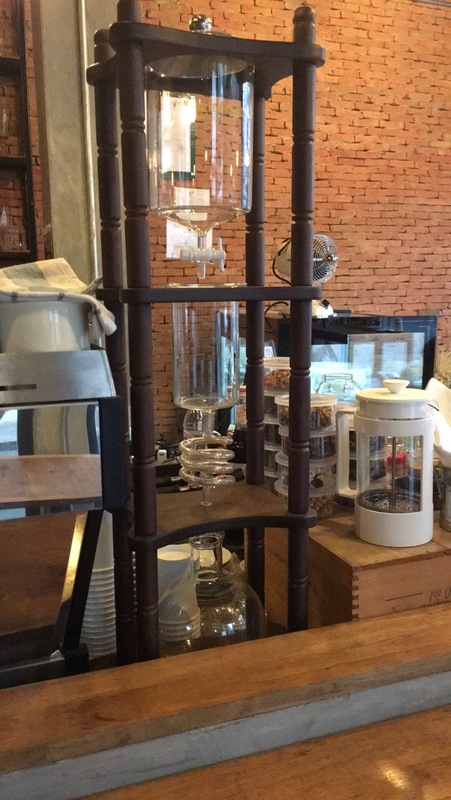 I knew I was in the right place when I walked in and the first thing I saw was this, a cold drip maker. Sadly, they didn’t make any cold brew coffee that day, so I had another cappuccino and a Banoffee dessert. I also met a nice young woman who was in town sightseeing between work jobs. She’s an electrician for Cirque du Soleil’s Quidam show, currently between Thailand and Australia, which I found really interesting. And she was apparently wanting to spend time around Americans, because when we went our separate ways she said she was going to a big Starbucks on the river. Once the rain died down, I caught the next Tourist Boat back south toward the hotel. I only took one photo along the way, this one of Wat Arun, also called Temple of Dawn. Beth and I had talked about going to see it. Normally it’s very pretty when viewed at dawn from across the river. But I learned that the whole thing is under construction right now. You can see it’s covered in scaffolding as they do some restoration work. It’ll be back to normal in a few more months, I guess. Sightseeing by river was nice, but I think the Tourist Boat would be a lot more useful as a way to get to a particular place where you get off and go explore an area on foot. That’s how it’s intended to be used, but since I didn’t have much time, I just watched the world go by on the water. That was relaxing and nice. Once I got back to the hotel mid-afternoon, I took one last shower and packed everything up, then caught a taxi to the airport. It was rush hour and traffic was super slow, but I just wasn’t up to lugging my big suitcase onto the Sky Train. I tipped the driver, got a happy handshake, and went on my way. All told, it took about 30 hours of travel to get from my hotel in Bangkok to Beth’s sister’s condo in Kansas City. I flew from Bangkok to Seoul to Chicago to Kansas City. That started at six in the evening Bangkok time, and I only slept about two hours enroute. So I guess that’s two hours of sleep in about 48 hours. I felt like a zombie when I arrived, so I got a nap and then immediately went clothes shopping so I’d have something nice to wear to the funeral events. I slept so well that night, and felt way better the next day after nine hours of rest. But now it’s night #2, and I’m awake typing. If this were Asia, the roosters would start crowing soon. What’s distance between the two Bangkok airports? 46 km, according to Google Maps. That takes 45 minutes to 2 hours, depending on traffic and travel method. Why do you ask? S0, about 28 miles. Just curious. I’m not familiar w/ many 2-airport towns – Dallas DFW & Love Field, Houston IAH and Hobby, Las Angeles LAX and John Wayne, and in those cases, maybe 45-60 minutes driving time apart depending on traffic. And perhaps in most cases, they have light rail between them. Just wondering why fly from one to other, given time it takes to get processed thru an airport these days. But guess maybe the land transportation alternatives at Bangkok make flying a viable option..
Oh, no, I didn’t mean that I flew from one Bangkok airport to the other one. I don’t think anybody would do that. I just meant that when I flew from Siem Reap to Bangkok, I arrived in “the other airport” meaning “the old one that’s less popular and that many tourists don’t even know exists”. If BKK is like DFW, then DMK is like Love Field.